There is a great deal of heat generated in the media on this subject, but very little of it is based on fact. Our research intends to contribute some evidence to this debate. We studied the levels of young people migrating to the UK from across the EU and elsewhere, their qualifications and what kind of jobs they did when they arrived. We found that young EU migrant citizens are well integrated in the UK labour market. They have higher employment rates, work longer and are less likely to receive jobseeker’s allowance than their UK peers. Nevertheless, we can also clearly identify differences in the pay and conditions they will accept. Wages of young EU migrant citizens from central and eastern European countries are often lower and the contracts are more likely to be precarious. In addition, these workers are very often overqualified for the jobs they are doing. We focused on six different groups of young people in the UK. Everyone in the study was aged between 20 and 34 (60% of all migrants who had arrived in the UK in the last five years are in this age group). Specifically we focused on those who had been born outside the UK with no UK citizenship and resident in the UK for one year or more, having arrived in the UK within the past five years. Our analysis is based on pooled data from the UK Labour Force Survey (2010-2014), a large quarterly survey of the UK resident population. We split them into the following groups: central and eastern Europe (Czech Republic, Estonia, Hungary, Latvia, Poland, Slovakia and Slovenia); Bulgaria and Romania; southern European countries (Cyprus, Greece, Italy, Malta, Portugal, and Spain); remaining EU countries (Austria, Belgium, Netherlands, Luxembourg, Denmark, Finland, France, Germany, Ireland and Sweden) and migrants from the rest of the world. Overall, EU migrant citizens have relatively high employment rates. Young migrant workers from central and Eastern Europe (CEE) have an employment rate of 82%, compared with an employment rate of 73% among young people born in the UK. While workers born in Britain on average worked a 40-hour working week, most EU migrant citizens worked at least one hour more per week. Our analysis shows that while 8.5% of those born in the UK were unemployed between 2010 and 2014, just 5% of those from CEE said they had been without a job during that time in the UK. Moreover, the probability of receiving jobseeker’s allowance is about 20% among unemployed EU migrant citizens and 38% among young British. Free movement of workers also contributes to minimising skill shortages. EU migrant citizens from CEE are much more likely than UK nationals to work in manufacturing, thereby positively contributing to the much-heralded “rebalancing of the UK economy”. Young people from Bulgaria and Romania are more likely than any other group to work in construction, thereby minimising the shortage of construction workers and positively contributing to the building of much-needed housing and infrastructure. Somewhat more surprising, especially if compared to the oft-used image of poverty migration, young EU migrant citizens from Bulgaria and Romania are as likely to work in financial services as UK youths. Many of the EU migrant citizens are highly qualified. 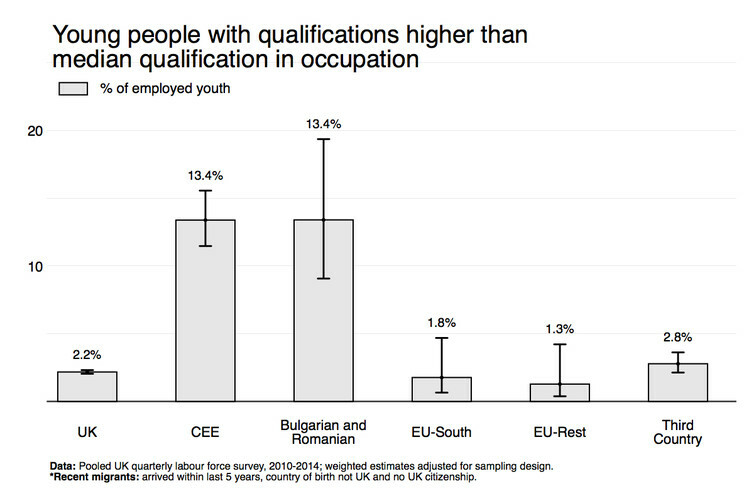 Recent young European migrant workers from CEE are often overqualified for the jobs they are working in. However, young migrants from the rest of the EU and outside Europe did better than expected in the jobs they secured when matched with the median for qualifications held by others in the same occupation. 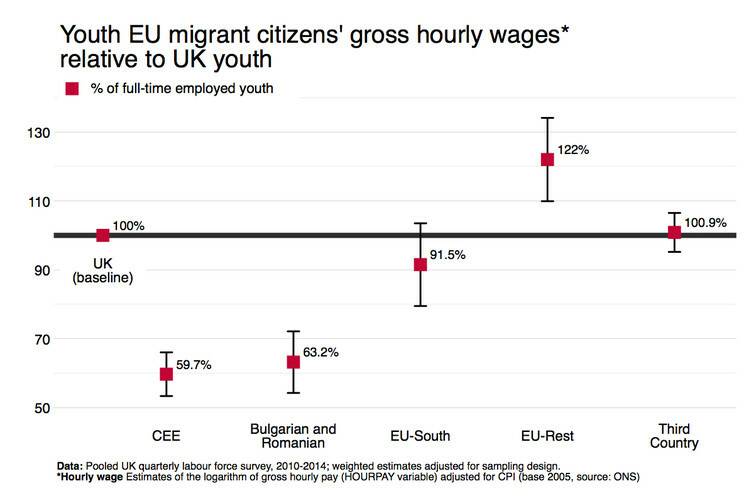 On average young migrant citizens from CEE as well as Bulgaria and Romania are paid around one-fifth less than their UK peers in gross hourly wages. Meanwhile, other EU migrant citizens do much better: those from southern Europe receive comparable rates to UK peers while those from the rest of Europe (mostly from France and Germany) having on average more than 20% higher hourly wages than their UK peers. Workers from the EU were overall more likely to be employed on a fixed-term contract or by a temping agency. Overall, young EU migrant citizens are well integrated into the UK labour market. However, there are significant differences when it comes to how much their pay and skills match – and migrants from CEE countries and Bulgaria and Romania are at a disadvantage on this front. The reasons why – whether it is discrimination against hiring eastern Europeans or a failing on their part – are questions for future research to address. What is clear in the context of the EU referendum debate, however, is that EU migrant citizens contribute to an overall high employment rate and the diverse workforce in the UK, by providing much needed skills in various sectors of the economy.